CBC Bias easy to find! Here's a link to my article in the Ottawa Sun. Don't forget - Don't miss our documentary: "This Hour Could Have 10,000 Minutes: The Biases of the CBC" on Sunday, November 13th at 2 PM in Ottawa. That Canadian soldiers were able to hold Kandahar is key to the reconstruction of Afghanistan. And it’s too bad that not enough Canadians know that. Don’t remember? Don’t be hard on yourself. You sure didn’t hear it from any Canadian parliamentary committee. If all Canadian soldiers ever did was win the Battle of Panjwaii in 2006, it would all have been worth it. Panjwaii was Stalingrad. Between that summer and July 2011, fewer than 3,000 Canadian soldiers kept the Taliban at bay. U.S. President Barack Obama’s “surge” of 30,000 soldiers is still having a hard time matching Canada’s accomplishment. And even now, sneers disfigure the faces of our country’s clever “troops-out pundits” whenever they’re reminded that millions of girls would have never gone to school had it not been for the gallant sacrifices of Canadian soldiers and their families. Had Kandahar fallen, Afghanistan would have been lost to the Taliban, and you don’t want to think about what would have come next. In the years to come, millions of Afghans will fondly recall that in their darkest hour, Canadian soldiers were watching their backs. Most Canadians still don’t seem to have a clue. A short preview of the History Wars debate tonight between Jack Granatstein and Michael Byers on the future of the Canadian Military. Guess what CBC did for Remembrance Day??? Yesterday, I was listening to Q with Jian Ghomeshi - always a dangerous thing when driving - and just what did he do one day before Remembrance Day? He actually had that crackpot Robert Fisk [an extremely anti-Israel journalist with the Independent in the UK] on for a segment on why people should not wear the poppy. I guess they want to show us how 'cool' they are - and sort of give us permission not to wear poppies. The gall. The chutzpah! Too late to add to our documentary, "This Hour Could Have 10,000 Minutes: The Biases of the CBC". But, it will highlight our second film. Don't miss our upcoming documentary - "The Hour Could Have 10,000 Minutes: The Biases of the CBC" this coming Sunday at 2 PM in Ottawa. Please join us for our first self-produced documentary which examines whether the CBC is biased against Israel and biased against conservatives. After the film, we will have a panel discussion with Mike Fegelman of HonestReporting Canada, Stephen Taylor of the NCC, Brian Lilley of Sun News, Eric Duhaime from the Le Journal de Montreal, and David Krayden from the Canadian Centre for Policy Studies. This event is part of the 2nd Annual Free Thinking Film Festival which runs between November 11-13th, 2011. Admission to this event is just $15! Or you can buy a festival pass for $75 and see all the events in the Festival. This event is co-sponsored by Le Réseau Liberté-Québec. - History Wars! Jack Granatstein debates Michael Byers on the Future of the Canadian Military. - The Biases of the CBC - a look at whether the CBC is biased against Israel and biased against conservatives. - Unmasked: Judeophobia and the Threat to Civilization. - The Living, a film about the Ukrainian fmaine of the 1930s. - Angryphone: The Struggle for Canada in Quebec. Just a few days to the 2nd Annual Free Thinking Film Festival 2011! Tickets for all events and all passes will be available at the door. You can also buy tickets right now at Compact Music (785 Bank, 190 Bank), Ottawa Festivals (47 William) and Collected Works (1242 Wellington). And, tickets are also available online - if you buy online you can collect your ticket at our will call desk at the venue. Time to get your festival passes! 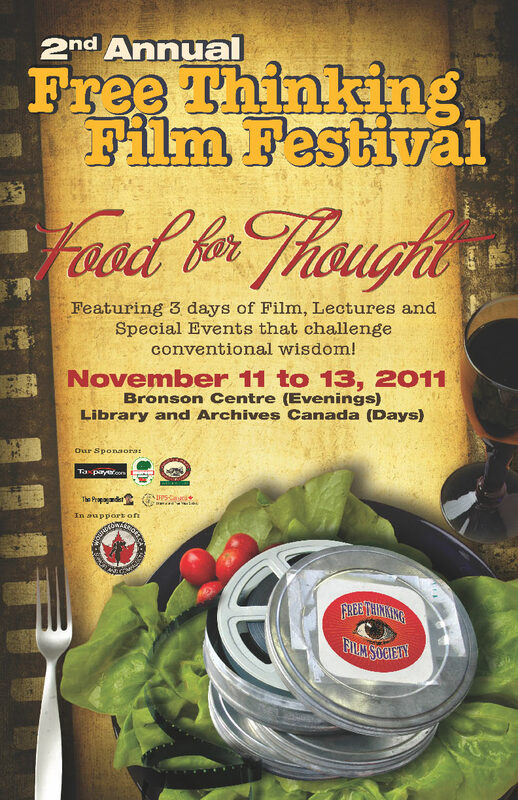 I really hope you can make it to the our 2nd Annual Free Thinking Film Festival which will run in Ottawa between November 11-13th, 2011. This year, we will feature three major events, two panel discussions and 23 films. There will also be a Free Thinking Alley where attendees can buy books and DVDs, and enjoy food and drink. History Wars, a debate between Jack Granatstein (Historian and former director of the Canadian War Museum) and Michael Byers (Professor of Political Science at UBC) on the future of the Canadian military, moderated by Michael Bliss. This event is co-sponsored by the Macdonald-Laurier Institute. "The Living," a film about the Ukrainian famine of the 1930s that was perpetrated by Joseph Stalin. "Unmasked: Judeophobia and the Threat to Civilization", the Canadian premiere of a documentary about the current political assault against Israel. Producer Gloria Greenfield will be in attendance to answer questions. On Saturday, November 12th, we'll be presenting the documentary, "Angryphone: The Struggle for Canada in Quebec," followed by a panel discussion with Howard Galganov, William Johnson, Jurgen Vollrath, Jimmy K (the producer) and Beth Trudeau. And, please don't miss our first self-produced documentary - "The Biases of the CBC" which documents CBC bias against Israel and against conservatives. After the film, we will be conducting a panel discussion with Brian Lilley of Sun News, Eric Duhaime of Le Journal de Montreal, Stephen Taylor of the National Citizens Coalition, Mike Fegelman of HonestReporting Canada, and David Krayden from the Canadian Centre for Policy Studies. "The Biases of the CBC" will be held on Sunday, November 13th, at 2 PM at the Library & Archives Canada (395 Wellington). Other films include "Angryphone," about English language rights in Quebec; "The Power of the Powerless," a look at the velvet revolution that toppled communism in Czechoslovakia; "Freedom of What?cott," a documentary about free speech in Saskatchewan; "Freedom Fighter," Rev. Majed El Shafie's campaign against discrimination against religious minorities around the world; "The 10 Conditions of Love," about Rubiya Kadeer, the leader of the Uyghur people and their fight to save their culture; "Cool It," why we should 'cool it' when it comes to global warming; "3 Billion and Counting," tells us why we need DDT to fight malaria in Africa; "Guilty Until Proven Innocent," about how fathers are discriminated against in the family court system; and "An Inconvenient Tax," shows how the income tax has been misused by politicians, and many more films. Please note that all events during the day take place at the Library & Archives Canada, and all evening events take place at the Bronson Centre. Our new documentary on the CBC has a new title: The Hour Could Have 10,000 Miutes: The Biases of the CBC. Please join us for our first self-produced documentary which examines whether the CBC is biased against Israel and biased against conservatives. - Mike Fegelman of HonestReporting Canada. - Stephen Taylor of the NCC. - Brian Lilley of Sun News. - Eric Duhaime from the Le Journal de Montreal. - David Krayden from the Canadian Centre for Policy Studies. The documentary and the panel discussion will be available for purchase on a DVD after the festival. Out of the ashes of two Quebec referendums on independence and 30 years of restrictive language laws, emerged a Canadian counter revolution in the province of Quebec in the 1990s. The Angryphone movement. Filmmaker Jimmy K sits down and speaks with the prominent players of this Angryphone movement and others. Topics of discussion: the Quebec language laws and language police; the mass Quebec exodus; the two Quebec referendums; the lead up to the Clarity Act and various Canadian civil and language rights events, boycotts and protests. Panel Discussion to follow the film. 5 Days left to get your passes to the Festival - You can buy passes at our retailers - Compact Music (785 Bank, 190 Bank), Collected Works (1242 Wellington), and Ottawa Festivals (47 William). You can also buy online (see our website for details) and at the door when you arrive at the venue. Please join us for our first self-produced documentary which examines whether the CBC is biased against Israel and biased against conservatives. After the film, we will have a panel discussion with Mike Fegelman of HonestReporting Canada, Stephen Taylor of the NCC, Brian Lilley of Sun News, and David Krayden from the Canadian Centre for Policy Studies. The current political assault against the State of Israel fundamentally is a war against the Jewish people and their right to self-determination. Jews are facing a threat much greater than a military threat in the battlefield or a traditional terror threat in urban centers. They are facing the possible uprooting of the very idea that there should be a nation state of the Jewish people. When the world’s financial bubble blew, the solutions was to lower interest rates and pump trillions of dollars into the sick banking system. The solution is the problem, that’s why we had a problem in the first place. For Economics Nobel laureate Vernon Smith, the Catch 22 is self-evident. But interest rates have been at rock bottom for years, and governments are running out of fuel to feed the economy. The governments can save the banks, but who can save the governments? Forecasts predict all countries’ debt will reach 100% of GDP by next year. Greece and Iceland have already crumbled, who will be next? Have you taken out a mortgage, invested capital or bought shares? If you have, likelihood is you lost out in the latest bust. Governments promised decisive action, the biggest financial stimulus packages in history, gargantuan bailouts: but what crazed logic is this, propping up debt with…more debt? This documentary brings an entirely fresh voice to the hottest topic of today. Here is the transcript from the Annual Meeting of the CBC held in Ottawa this week. Fred: My name is Fred Litwin and I am the President of the Free Thinking Film Society. On November 13th, we're actually showing our own self-produced documentary on the biases of the CBC. It covers CBC bias against conservatives and CBC bias against Israel. You talk about linkages [in the community] - I've sent many e-mails and I am very anxious in having someone from the CBC sit on our panel. Will you send someone to sit on our panel? M. Lacroix [President and CEO of the CBC]: Thank you for the invite. We know about this event. We think this is more an opportunity for people of like-minds to have a conversation amongst themselves - let's call them activists - that's their right. We will not participate because we don't think that as a public broadcaster we should get involved in something like this. If you have issues about the CBC and our biases, we have people like the ombudsman in French and in English, and we welcome you to go through normal channels. I would have thought that he would have shown some curiosity to seeing our film. Isn't it a bit crazy - we're going to have 200-300 people talking and discussing the national broadcaster...and they won't even turn up? Shot undercover inside Cuba, Oscar’s Cuba tells the story of Dr. Oscar Elias Biscet, an Amnesty International prisoner of conscience who has just been released from a 25-year prison sentence for the crime of “disrespecting the revolution” through his promotion of human rights, democracy and respect for human life in Cuba. Oscar’s Cuba reveals the truth about the Cuban government’s unjust detention of Dr. Biscet and thousands of other human rights supporters who have risked and sacrificed everything for the betterment of their nation. "I am convinced of my ethical principles, the suffering of another human being is also mine, I cannot accept evil, because if I did my bones will erode and my soul will never be at peace." For decades, sociologists, psychologists and academics have examined the plethora of social ills children of divorce encounter over their lifetimes. For the first time, the fathers of divorce are given a platform and a voice to share their most intimate feelings around the challenges of not having full and complete access to their children. We have all heard the stories of biases family courts, bitter spousal retributions, exorbitant alimony, child-support and lawyer fees, but have we ever stopped to wonder what goes on in the heart of a father, when his is alone, with no knowledge of where his children are? I was actually at the CBC Annual Meeting today in Ottawa. I was leafleting outside about our upcoming film and panel on the Biases of the CBC. I went inside for the presentation and I actually got to ask M. Lacroix a question. I told him about our event and I asked him if the CBC would like to be on the panel. He said he was aware of the event, but that the CBC would decline because the event appeared one-sided and just full of activists. I then told him there would be more people at my event than at his! You'd think he's show some interest in actually seeing our documentary, no? On March 24th 2004, a fifteen year old Palestinian boy named Hussam Abdu was apprehended at an Israeli border checkpoint with live explosives strapped around his waist. Instead of detonating the bomb, Hussam voluntarily gave himself up to the Israeli army and is now serving time in the HaSharon prison for attempted murder. In the weeks that followed Hussam's arrest, news media from around the globe received conflicting reports. The Palestinian Authority claimed that Hussam had been set up by the Israeli Defense Forces (IDF), while the IDF maintained that Hussam was the latest example of children recruited for suicide missions by terrorist organizations. The Making of a Martyr documents the ongoing education and recruitment of innocent Palestinian children to become human bombs. The film is composed of first-hand interviews with families of suicide bombers, leaders of terrorist organizations, children imprisoned for participating in violent activities and others. Are the staggeringly expensive actions now being considered really helping to save the world – or are we just burning money? In this eye-opening documentary, author Bjorn Lomborg (The Skeptical Environmentalist) asks us to question the facts and the solutions. Why in the world are we spending so much money on ‘green’ initiatives....for such little gain? Are there better ways to solve the problems? How else could that money be spent? No matter what our opinions are on the environmental movement, Cool It is an “engrossing film” (New York Times) that asks us to rethink our polarized views. The Living to play in Ottawa on November 12th..
Side by side with their story, is the story of Welsh journalist Gareth Jones. He travelled through Ukraine, by train and on foot, to see for himself what the people were enduring. Jones published articles in British newspapers drawing attention to the lack of even basic food in once rich Ukraine and told of the suffering and death. But on the whole he was ignored and even ridiculed for suggesting such things. Gareth Jones was killed in 1935 in Manchukuo and some claim that his untimely death at 29 years old was the result of Russian revenge for Gareth Jones’ willingness to expose wrongdoing.